Although a Democrat for most of his career, Wilder developed a reputation as a law and order fiscal conservative, a position that appealed to many conservative voters in Virginia. He also publicly sparred with fellow Democrat Senator Chuck Robb, and supported Republican Mark Early for the U.S. Senate. When he left office in 1994 Wilder declared himself an independent. 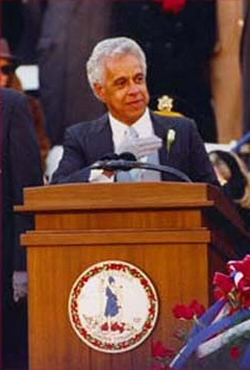 In 2004, L. Douglas Wilder returned to politics and was elected Mayor of Richmond with 79% of the vote. He became the first directly elected mayor of Richmond in sixty years. Wilder is completing his first term in office. Donald P. Baker, Wilder: Hold Fast to Dreams: A Biography of L. Douglas Wilder (University of Michigan, Seven Locks Press, 1989); Judson L. Jeffries, Virginia’s Native Son: the election and administration of Governor L. Douglas Wilder (Purdue University Press, 2000); http://www.vahistorical.org/collections-and-resources/virginia-history-explorer/l-douglas-wilder.